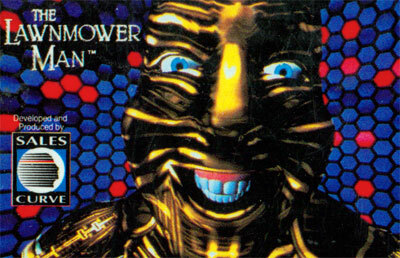 The Lawnmower Man is the game based on the 1992 movie of the same name (itself loosely based on a Stephen King short story) starring pre-Bond fame Pierce Brosnan as Dr. Lawrence Angelo, a scientist working for Virtual Space Industries in "Project 5", a secret research that attempts to increase the intelligence of primates using psychotropic drugs and VR training. With his reluctance to aim the research to military purpose, after one of the chimps escapes and shoots a guard in the process he is given a forced vacation, and while taking notes on the need for experiment with a human subject, he notices Jobe Smith (Jeff Fahey), a simpleton who makes his living on odd jobs such as mowing the grass (hence, the title role). The first experiments quickly increase Jobe's intelligence, and while after an accident Angelo stopped the experiments, The Shop, a secret agency overviewing Project 5, reinserted the drugs responsible for violent behaviour into the program and sped up the treatment. As Jobe starts to develop telekinetic powers, he starts to take revenge on those who abused him before he started the treatments, and plots to take over all computers in the world.